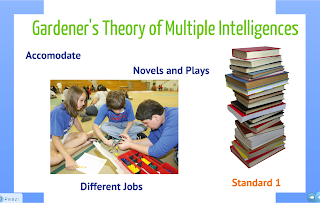 One main goal of the teacher should be to accommodate students of all different intelligences. Middle school Language arts classrooms study several different novels and plays. Middle school Language arts teachers should require their students to do a group presentation on a novel or play studied in class. Within the group there should be several different jobs that each student will choose to sign-up for according to what they feel best suits their own intelligence. Not all jobs will need to be utilized, however only one person per group can have each job. The jobs could include the Scribe who writes the written report (verbal intelligence), the speaker who presents the material to the class (interpersonal intelligence), the designer who creates the visual aid for the presentation (spatial intelligence), the actor(s) who choose to reproduce a scene from the story (bodily-kinesthetic intelligence), and the interpreter who explains a specific theme or idea from the literature and relates it to a current issue or event (intrapersonal intelligence).